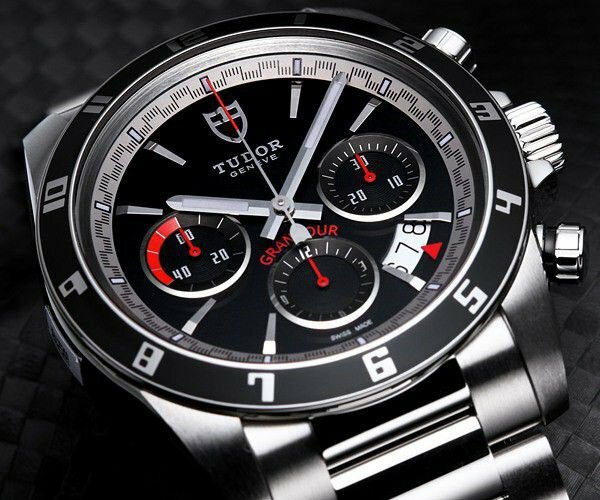 Tudor is the sponsor of the oldest endurance race in the history of motorsports, the 24 Hours of Le Mans. So it should come as no surprise that they drew inspiration from the exciting world of motorsports when developing the Grantour line of automatic racing watches. The Tudor Grantour series has three variations, all of which offer their own feature sets and functions including bracelet options, dial colors, and movements. With so many options, it’s easy to find a reference that suits your lifestyle and watch preferences while staying true to its style as a racing watch. Here is the Tudor Grandtour Date. The first is the “three-hand” Grantour Date ref. 20500N with central hour, minute, and seconds hands. Out of all three versions of the Grantour, this variation is perhaps the most versatile. While its design mirrors that of its chronograph counterparts, the lack of subdials on the Grantour Date creates a clean style that is just as suitable at the office as it is paired with a tuxedo or on the racetrack. The case measures 42mm and is constructed out of stainless steel in a satin and high-polish finish. A winding crown protects the 2824 movement from depths of up to 150 meters. A fixed stainless steel bezel features a black lacquered finish and highly legible Porsche-inspired Arabic graduations. You may notice that, while the dial features a simplistic design, it’s actually incredibly functional. Sword hands are filled with highly visible lume, a date window is visible at the 3-hour marker, and a minute track circles the dial with a unique, scalloped design. 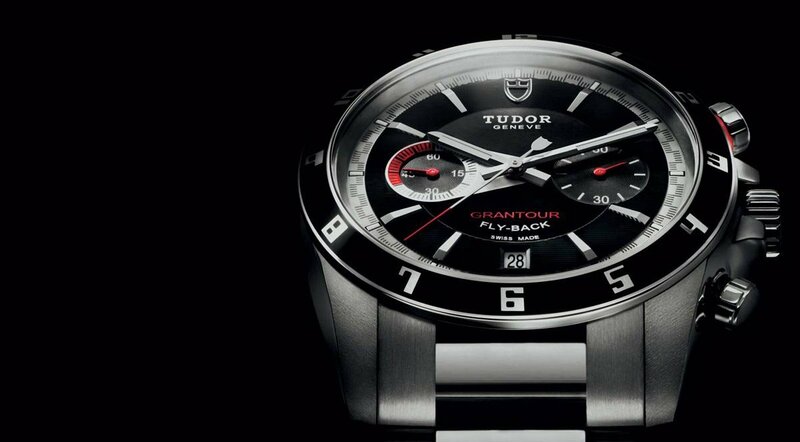 The two-register Tudor Grantour is considered the most innovative of the three Grantour watches. While traditional chronographs, like the Rolex Daytona, require three separate clicks of the pushers to start, stop, and reset the timer function, the Fly-Back references 20550N and 20551N can be reset while they’re still running with a simple click of the side pusher located at the 4-hour marker. Not only is the Fly-Back function more convenient, but it offers a much more reliable reading as the wearer doesn’t have to click multiple side pushers to keep time. The Tudor Grandtour Chronograph is an excellent timepiece to have. 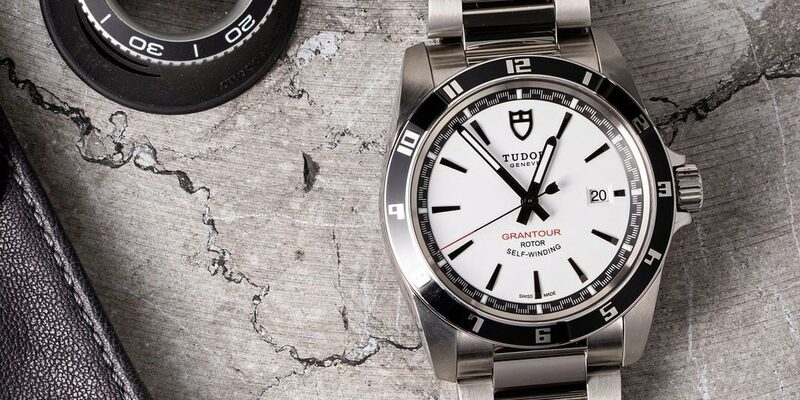 What are your thoughts on the Tudor Grandtour series? The last variation of Tudor’s racing icon is the three-register Grantour, featuring a complicated Valjoux 7753 movement developed to include a 30-minute totalizer and 12-hour counter on its dial. Upon first glance, the dial itself proves that this is a truly impressive chronograph. Red accents all over the dial alone tell you that this Grantour was built for speed. The minute hashes are present on all three-variations and allow the wearer to time speeds with incredible accuracy. Depending on which variation you choose, the Grantour is available with either a black, silver or white dial and comes in either a stainless steel or two-tone steel and 18 karat pink gold finish. Whether you want the Grandtour Date, or the Grandtour Fly-Back, or the chronograph, they are all fantastic picks.